Who Needs Access to Your Orgs and Communities? How Does Salesforce Identity Help Employees and Your Company? How Does Salesforce Identity Help Customers and Partners? Describe how employees benefit from Salesforce Identity. Describe how customers and partners benefit from Salesforce Identity. Describe what’s important when setting up user registration. 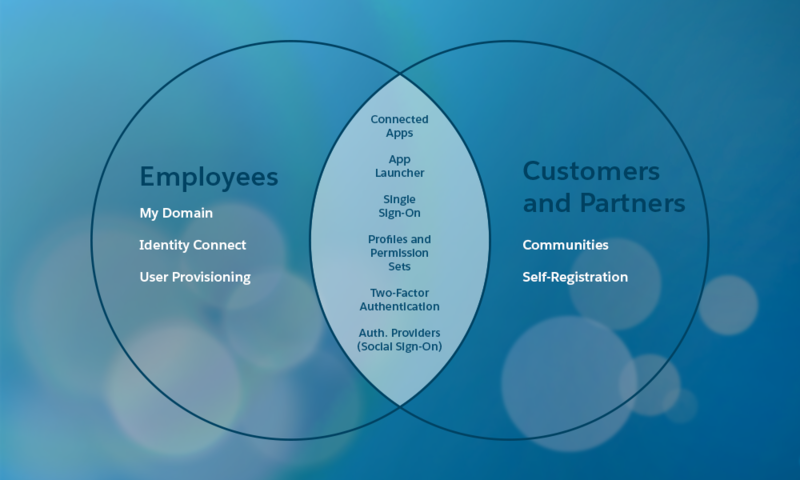 Know which features of Salesforce Identity benefit employees, which benefit partners and customers, and which benefit both. One identity with access to many services means different things to different audiences. In the previous unit, we checked out the major features of Salesforce Identity. Now we’re going to consider the people who use those features, because different groups of people have different needs for what Salesforce Identity has to offer. We’ll talk about how two main groups use Salesforce Identity—first employees, then customers and partners. Each group has distinct needs for Salesforce Identity. You and your coworkers have special access to your company’s Salesforce orgs and other online assets. Your company knows all of you well. It trusts you with valuable data and tools so that you can make the company’s products and deliver its services. To safeguard this trust, you, as a Salesforce admin, have to make sure that special access is granted only to employees. And to keep the business running efficiently, you have to clear away obstacles that make it hard for employees to do their jobs. 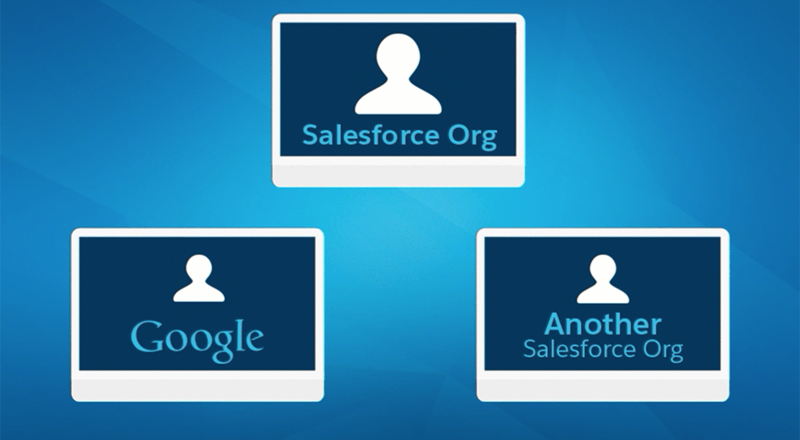 Other people need access to your company’s Salesforce orgs or communities, too. Some of them are customers or prospective customers. Others are partners who work with your company for the benefit of both businesses. Your company doesn’t know these people as well as it knows employees. You don’t want to give customers and partners the same privileged access that employees get, but you still want to make it easy for them to accomplish their goals when they visit your company online. You and the other employees of your company work hard to make the business successful. That’s just how you roll. But who wants to hunt and peck through a maze of passwords, verification codes, security challenge answers, and reCAPTCHA phrases before you can get to the app you need to start your real task? That feels like work, yet you don’t feel like you’re getting your job done. As a Salesforce admin, you get it. You understand that for your coworkers to be as productive as possible, they need a simple, secure way to access your Salesforce org and other apps and services. That simple, secure way is Salesforce Identity. With Salesforce Identity, you can remove barriers that slow employees down while maintaining robust security controls. Here are some key benefits for employees, for you, and for your company. Employees can log in to a workstation and connect to a Salesforce org without logging in again. In fact, they can have a single login that works for all their web and mobile apps. You can give them one-click access to third-party productivity tools and services, like Gmail or Microsoft Office 365. Yes, you heard that right: one click. No additional login required. And as your company implements new services, you can give employees easy access to those as well. Just add everything to the Salesforce App Launcher. The App Launcher gathers all the apps an employee needs in one place—each app is just a click away. Managers and supervisors can have more control over their employees. If you want fine-grained control over who uses what, you can require that a manager or supervisor approve employee requests to access an app or service. And when you need to revoke access to an app, you can do that, too. The magic of Salesforce Identity is that more convenience plus greater control adds up to enhanced security. One identity source for user credentials across corporate networks and the web makes it easy for you and other Salesforce admins to monitor and manage usage. Reduce redundant accounts, and you reduce your vulnerability to malicious activity. And with two-factor authentication, you can be twice as confident that your users are who they claim to be. You’ve seen how Salesforce Identity helps you optimize the user experience, save time, and minimize frustration for people who work for your company. You can also make life a little better for another valued group: your company’s customers and partners. Customers and partners want some of the same things that employees do. They want to access your Salesforce org or community to collaborate, get answers, and do business. They don’t want to log in over and over again anytime they want to access other outside services. By now you know that Salesforce Identity has all that covered. But you might not know that with Salesforce Identity, you can offer a few extra goodies to your company’s customers and partners. Customers and partners can use their existing social media accounts, like Facebook or Google, to log in to Salesforce orgs and communities. They don’t have to set up a new account each time. They can easily approve and share access to useful information, like their address and phone number. Remember how well your company knows you and your fellow employees? As you could imagine, customers and partners are more of a mystery. Compounding the mystery is the fact that they can connect with your company through one of several channels: the web, an app, an API, a device, or a product. Salesforce Identity helps your company recognize these customers and partners across all channels and build a multidimensional picture of them. They’re no longer inert, isolated chunks of identity information in your contacts database. Now they’re real users who can log in and interact with other engaged members of your company’s vibrant online community. Here are some key benefits of Salesforce Identity for customers and partners and for your company. When you want customers and partners to register to use your org or community, you can customize the registration process. During registration, you can collect vital pieces of information to personalize the user experience, such as a location, contact preferences, or profile photo. Users can easily edit that information later to keep it up to date. Because Salesforce Identity is part of the Salesforce Platform, you can launch workflows and other business processes right from user registration. Your company needs to control its brand during every stage of a user journey, from registration to login and beyond. You want customers and partners to encounter your corporate brand, not ours. You can configure Salesforce Identity so that your customers and partners never guess that Salesforce is behind the experience. Salesforce Identity helps you create a user journey within your own brand. Some customers don’t want to scribble yet another username and password on the sticky note dangling from their monitor. Instead, they’d rather sign in to your site using their credentials from Facebook, LinkedIn, Twitter, or another social provider. Salesforce Identity offers out-of-the-box social sign-on capabilities for popular social networks. It also supports OpenID Connect–based providers. And if you’re up for a bit of coding, you can create a custom authentication provider plug-in to authenticate users with any provider that uses OAuth. As icing on the cake, Salesforce can use the social sign-on process to register new user accounts automatically, without requiring the customer to fill in a form. Your company’s online customer experience likely includes a mix of Salesforce and non-Salesforce web content, services, and apps. Because Salesforce Identity provides SSO for customers and partners, they can move seamlessly between your company’s sites and a third-party website without encountering disruptive login screens. Salesforce Identity is part of the Salesforce Platform. It harnesses the power of the platform to give a complete and consistent picture of each customer to multiple divisions of your business. For example, you can configure social sign-on to create both a new user and an associated contact record. Then you can kick off an email communication campaign to drive engagement. Or you can open a task to remind an account executive to give the new user a welcome call. You’ve learned a lot about Salesforce Identity features and how they benefit employees, customers, and partners. Now let’s look at how everything fits together. As you move along this trail, you’ll practice implementing each feature. But remember, you don’t have to set up everything at once. These features can stand alone or build on one another to create a secure, yet flexible, user experience. Next up, we introduce you to the language of identity. Sound boring? Maybe intimidating? Don’t worry. We just want to give you some background so that you’re not blindly changing your Salesforce settings without understanding what you’re doing.